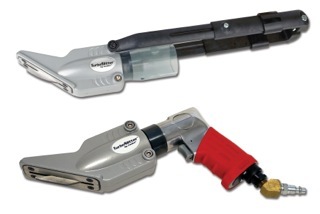 MANKATO, Minn. – Condux International recently unveiled the TurboSlitter™ pipe splitting tool. Available in two models, pneumatically powered and cordless drill attachment, the TurboSlitter quickly cuts through HDPE ductwork saving time and effort. The TurboSlitter is designed to split HDPE pipe with wall thicknesses ranging from 0.097 to 0.216 inches. The cordless drill attachment quickly adjusts to fit almost any rechargeable drill, 14-volt and larger. The pneumatic model is self-contained and requires only a small air compressor to operate (min. 75 psi, max. 90 psi). Both units feature a lightweight shear head for simple single-hand operation.